Is there a patron saint of copy machines? | Walk with us! Is there a patron saint of copy machines? In the Catholic Church there seems to be a prayer and a blessing for everything and everyone (including animals who will be blest in many parts of the world on the Feast of St. Francis of Assisi on October 4th). Yesterday our new copy machine was delivered. The house has been without one since before I first came to Christu Dehon Nivas in 2013. The brothers [students] who get 300 rupees a month [about $4.50) pocket money to take care of personal needs, recreation, etc., have been paying 1 rupee a page for anything they need copied for school. At the first community meeting before the opening of the school year the request was made for a house copy machine. To make a long story short I heard about the need and when I was given money from two residents at Sacred Heart at Monastery Lake for India I suggested to Fr. 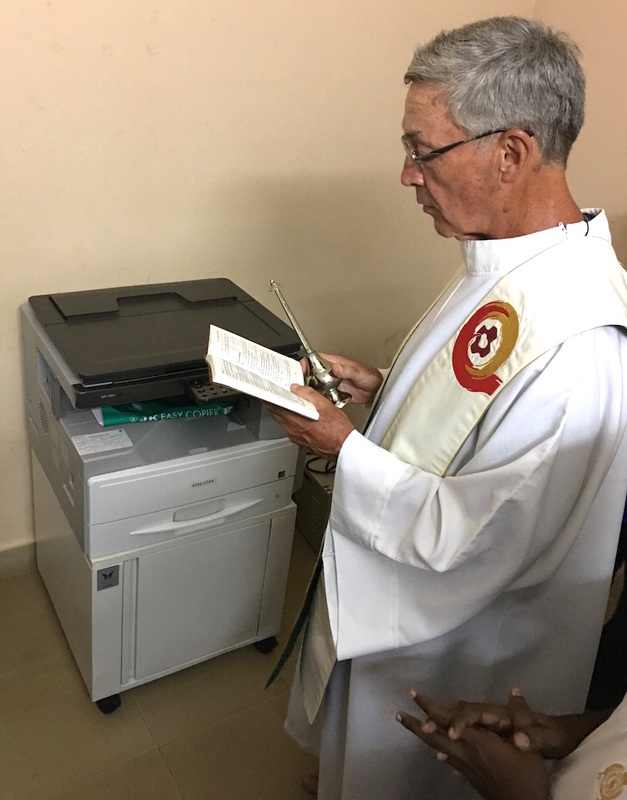 Michael Augustine, SCJ, (our rector) that it be used towards the copy machine. Their gift came to just under 50,000 rupees [about $750]. Fr. Michael Benedict, SCJ (district treasurer) said that the district could cover the difference. Indian Catholics believe in having just about everything blessed, especially if it is new. Thankfully, as I noted at the beginning, there is a blessing for almost everything, and if you can’t find one you can create one. I asked Br. Manish Nayak, SCJ (2nd year) to do the reading as he and I were going to do the blessing of the new clothing shop in Vempadu, during last week’s inauguration of the our new house but that got postponed as the room wasn’t ready. It’s now on our future to-do list when called upon. There was a rather long reading that Manish prepared for the occasion and since he didn’t get a chance to deliver it in Vempadu I thought it fitting he do the reading for our copy machine blessing. Though I won’t mention the names of our two benefactors from Sacred Heart at Monastery Lake here, I did let the brothers know who they are and asked them to pray for them and their needs. So often our generous benefactors are like ghosts to are the recipients of their kindness, i.e., unknown to us. When you can put a name or a face to the generosity of others I think it is more meaningful. The machine is located in the brothers computer room; all four computers are wired to it. The next model up allowed for a wireless connection but the expense was beyond our capabilities. Laptops can be brought to the room and manually connected when printing is needed. So in closing, we are most grateful to the generosity of others for making life and education here at Christu Dehon Nivas not only better but in ways that will aid in our spiritual, educational and human interaction and communication. This entry was posted in Fr. Tom Cassidy and tagged Dehonians, Fr. 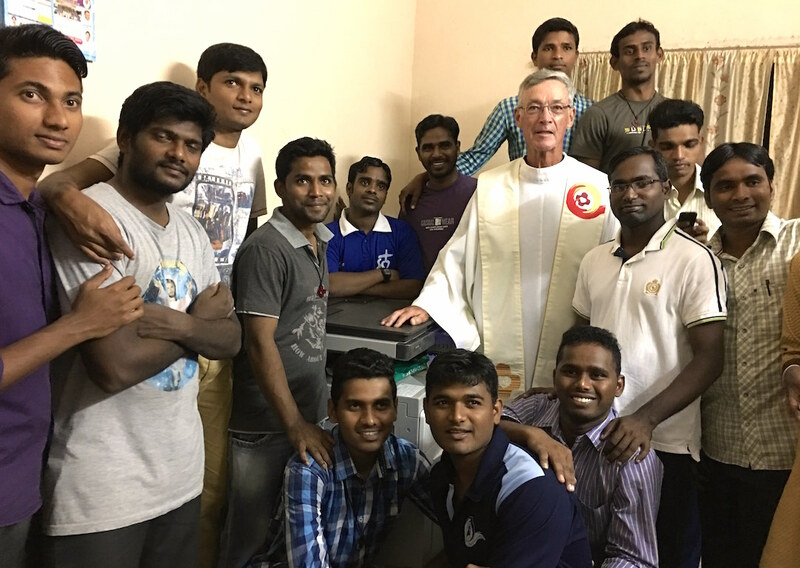 Tom Cassidy, India, Priests of the Sacred Heart, SCJ. Bookmark the permalink.